Emerging generations, ‘Who needs a car? That’s the growing sentiment among Gen Yers, those in their teens and twenties, as evidenced by the graph above, provided in the Advertising Age article, Is Digital Revolution Driving Decline in U.S. Car Culture? Some may argue that many states raised the minimum age for driver’s licenses, but as you can see above, the claim doesn’t hold true for those 18 and 19. Others cite the economic downturn for the drop in numbers, but in many ways, the downturn marks the difficulty in a massive shift in values from one industry (autos in the industrial age) to another (smartphones in the knowledge age). In a survey of 3000 consumers born from 1981 to 2000, not one car brand ranked in the top 10, lagging far behind companies like Google and Nike. 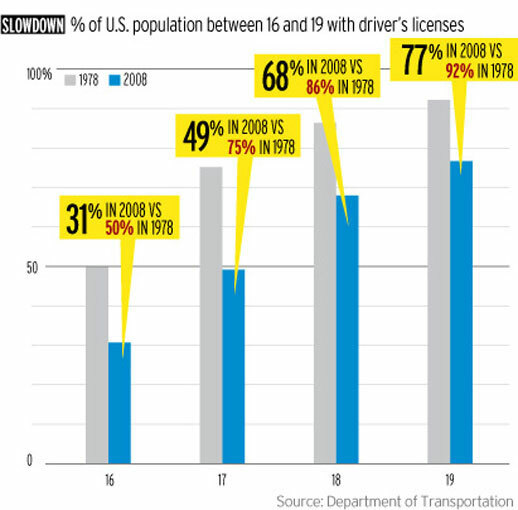 According to the article, further evidence shows that the share of automobile miles driven by those of age 21 to 30 in the U.S. fell to 13.7% in 2009 from 18.3% in 2001 and 20.8% in 1995, illustrated in the graph below, based on data from the Federal Highway Administration’s National Household Travel Survey released this year. This all happened while Gen Yers increased their proportion to the population from 13.3% to 13.9%. So, Gen Yers aren’t only driving less, they’re driving increasingly less than everyone else (see chart of ‘everyone else’ below). In 2008, 46.3% of potential drivers 19 years old and younger had drivers’ licenses, compared with 64.4% in 1998, also according to the Federal Highway Administration, and drivers ages 21 to 30 drove 12% fewer miles in 2009 than they did in 1995. Researchers state that the internet is keeping people from driving more, especially as digital communications becomes more mobile (ie smartphones) and accessible (ie 3G/4G, wi-fi on mass transit). 46% of drivers aged 18 to 24 said they would choose Internet access over owning a car, according to the research firm Gartner. However, Gen Yers themselves claim their main reason is the environment. Read more about this culture shift for all generations in the previous entry, Emerging gens prefer world beyond cars.